Temporarily out of stock. Please check back later. 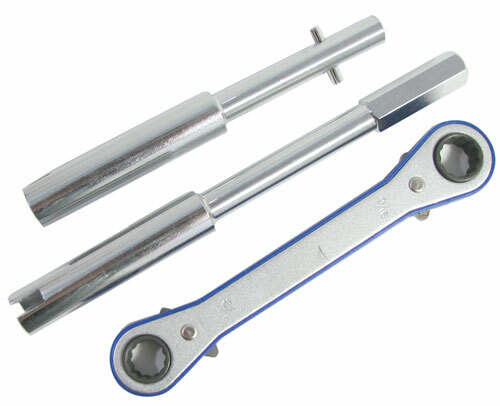 From Power Gear® this set of RV tools has a 6-7/8" long ratcheting chrome vanadium box wrench with 1/2" and 9/16" drives and a two-piece extension arm with a 9/16" hex bolt at one end and 9/16" ID port with 1/2" and 1/4" slots opposite each other. And it’s cute. 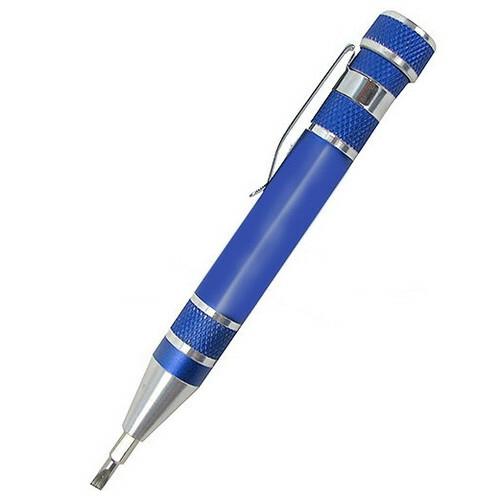 Just 4-3/8" long with a pocket clip, it looks like a pen but it has (8) driver bits stored in the barrel. 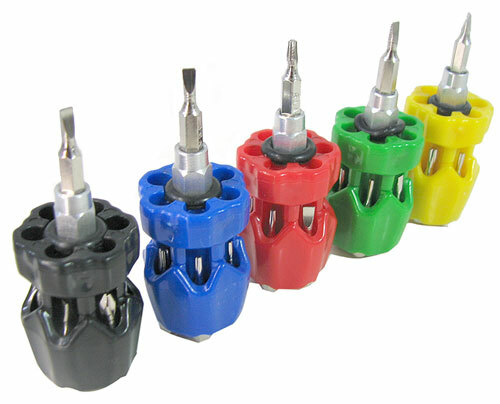 The 5/32” hex bits include slotted 2mm, 3mm, Phillips #1 and #2, and T5, T6, T7 and T8. We’ll pick one in red, black or blue, because who cares? 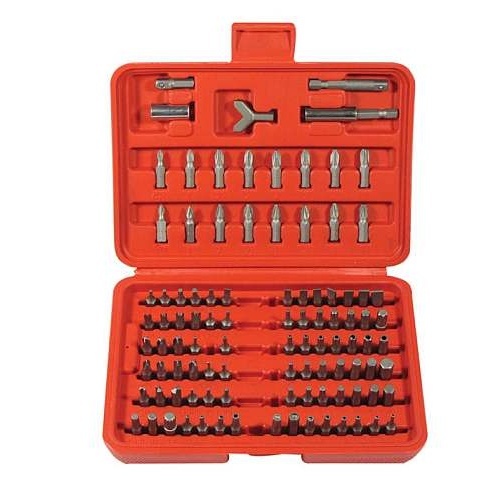 This 34-piece set of chrome vanadium bits includes 1/4" hex bits with (8) security Torx from T8 to T40; (3) Pozi from PZ1 to PZ3; (2) Phillips at PH1 & PH2; (6) security Hex from H2 to H6; (4) Tri-wing from Y1 to Y4; (4) spanner head from U4 to U10; (3) Torq from S6 to S10; and a 6mm slotted bit. All are 3” long. Includes (2) mag-demag blocks, and a storage case. How big are your locking pliers? This giant pair, in hardened steel, will grip the largest vices in captivity at 14” long with serrated 1-7/8” jaws that adjust from 11/16” to a gaping 2-1/4” ID. 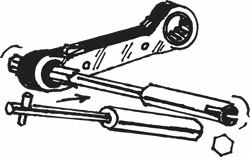 Tighten via an 11/16” bolt. Easy to locate, too, in a popsicle-ish lime green. These 1-5/8" long x 3/16" tiny screwdrivers come with (7) chrome vanadium bits: PH0 & 00; 2mm & 3mm slotted; and T-5, 6 & 8. All fit into a rubberized driver handle. In assorted colors that we won't even tell you about because we're gonna pick anyway and at this price you probably don't even care. The perfect tool for your junk drawer, glove compartment, backpack or front pocket. This handy set is pretty much the answer to your socketing needs. 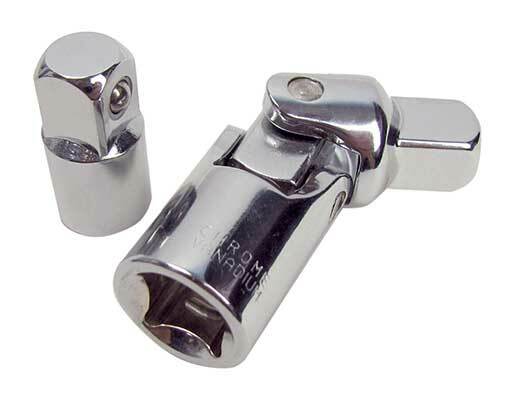 The (40) pieces include a 3/8” reversible ratcheting handle; a 6” driver handle; (14) 1/4” metric sockets from 4mm to 13mm; (14) SAE 1/4” sockets from 5/32” to 9/16”, a 3/8" to 1/4" adapter, 1/4" SAE sockets at 1/4”, 5/16" and 3/8", a 21mm spark-plug socket, a 3” extension, 3/8" sockets at 15mm and 16mm, a color sleeve, and a case. 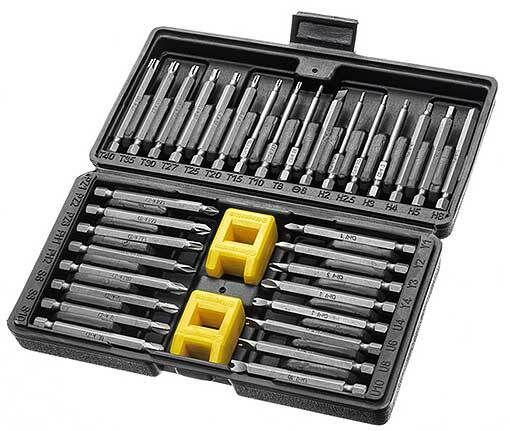 Is that a set of socket drivers in your pocket or did you just forget your toolbox? Imagine a set of (7) drivers mounted together and folding to a compact 4-3/8” x 2-1/8” x 1”. You pick the metric drivers at 5mm, 6mm, 8mm, 9mm, 10mm, 11mm and 12mm; or the SAE set at 3/16", 1/4", 5/16", 11/32, 3/8", 7/16" and 1/2". 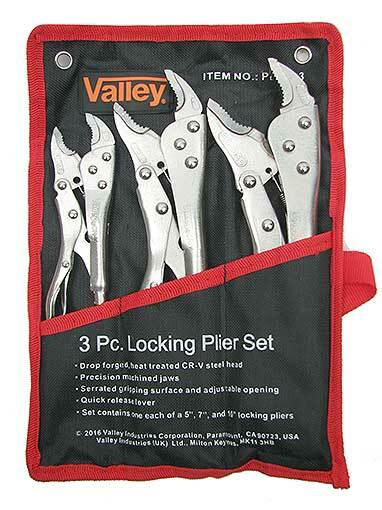 We like these small pliers and cutters - they're a higher quality than most of the Chinese import tools we're offered. 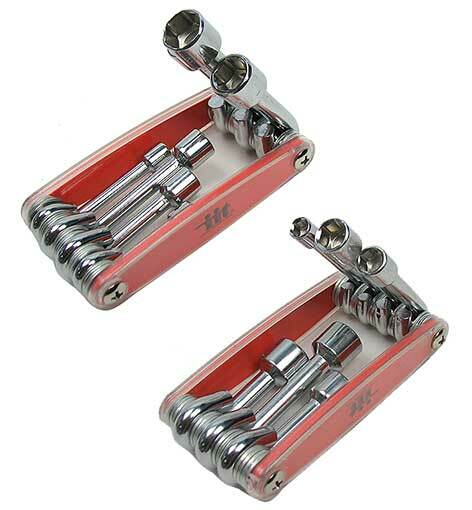 They are drop-forged, high-carbon steel with double-leaf springs, lap joints and rubberized foam handles. 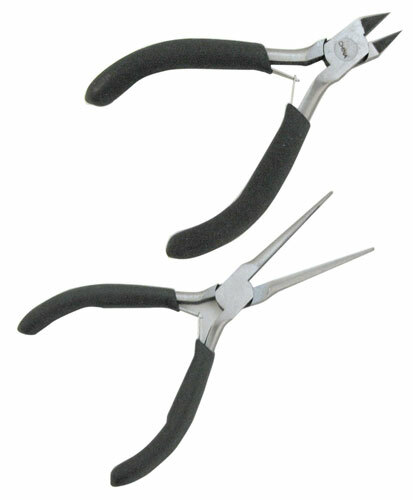 There is a trim 6" needle nose, and a 4-1/2" mini-round diagonal cutter. For precision work and hobbies, and especially nice for anyone with small hands. 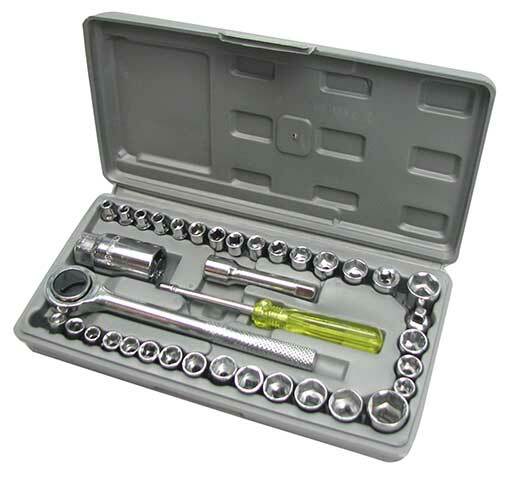 The boy scout of ratchet accessory sets, this 7-piece collection of chrome vanadium socket and U-joint adapters includes 1/4" to 3/8", 3/8" to 1/4", 3/8" to 1/2", 1/2" to 3/8", and U-joiunts at 1/4", 3/8", and 1/2". You need this. Anybody who's ever made a third trip to the hardware store on the same day needs this. The (100) -- count 'em, (100) -- chrome vanadium driver and bit attachments include slotted, Phillips, square (Robertson) head, torx, hex and 12-point bits, plus security Phillips, torx and hex, and (4) different driver adapters (one of which, a super-cute cup-hook driver, has us oddly excited). They're all in a flip-top plastic case. How come it's surplus? If you turn it upside down and shake it, some of the bits fall out of their little size-marked slots. So don't do that. Or stick a thin sheet of foam inside it and all will be well. 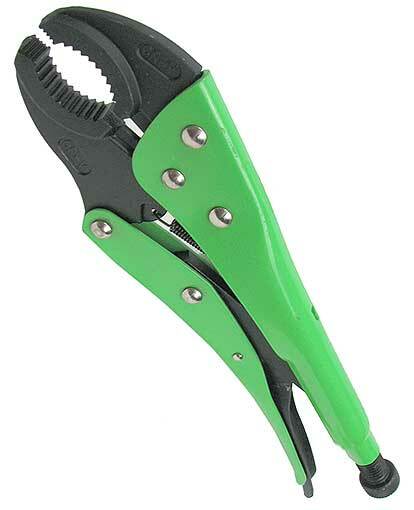 Nice set of (3) locking pliers (called Mole grips in the UK, and you’re welcome) include a 5” pair that opens to 3/4”; 7” pair opening to 1-1/4”; and a 10” pair opening to 1-1/2”. All have quick-release levers and serrated jaws, and they’re rolled up in a fabric storage pouch.